On her way home from work eight years ago, Laura Moulton, an artist, writer and adjunct professor, briefly bonded with houseless man over a book they were both reading. Their conversation got Laura thinking about the barriers in place for houseless community members to access literature. 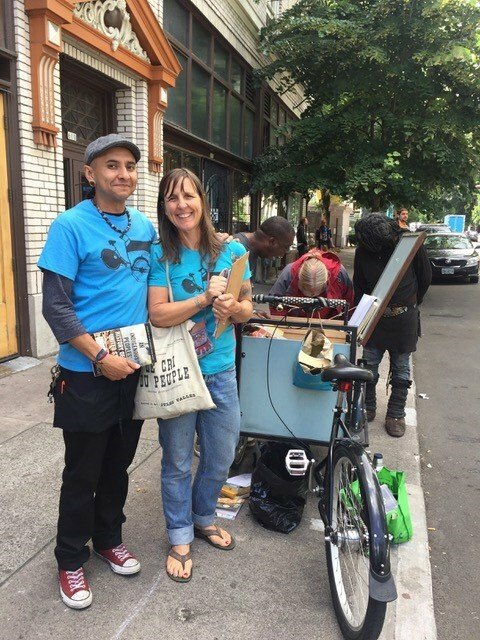 It was not long afterwards that Laura launched Street Books, a mobile library serving people who live outside, in transitionary housing, and on the streets in the Portland metro area. Seed money came from a project grant from the Regional Arts & Culture Council (RACC) and a Kickstarter campaign. Contributions from additional individuals and foundations soon followed, and what Laura initially conceived as a three-month Summer project is now a growing nonprofit that operates year-round. Her team comprises three staff, eight street librarians, and five board members, and together, they check out more than 1,500 books each year. The organization breaks down the barriers to literature by issuing their patrons a Street Books library card without proof of address or identification. The return policy is simply a when-you-are-done-reading, next-time-we-meet handshake agreement. There are no late fees, nor fines. The Street Books team of librarians commute by bicycle to locations in Southeast, Northwest, and downtown Portland, June – October. Their new permanent office and library site in inner Southeast keeps the program running through the winter months. Street Books librarians Pépe Espinoza and Diana Rempe travel through NW Portland. At its core, Street Books is about breaking down perceived notions about people who are houseless. Books are their medium of choice for bringing visibility and support to these community members who are often pushed to the margins of society. With genuine humility, they engage their patrons in conversation and document their stories. Fred, a regular Street Books patron, visits their Southeast Portland location at the same every week. He always returns three books and then checks out three new ones. The team of librarians have enjoyed getting to know this quiet, kind man in his 70s. He loves the mystery writer Janet Evanovich because of her unlikely protagonist, Stephanie Plum. 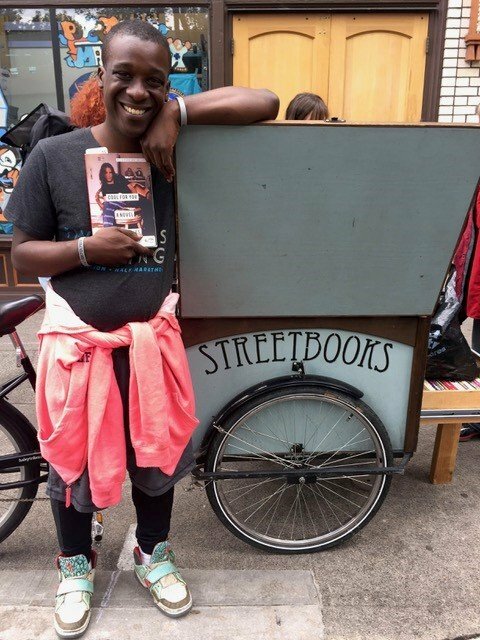 Many Street Books team members have experienced living on the streets themselves – or are employed by local libraries and social services agencies. They all bring insight and empathy to each shift, and they have witnessed Portland’s housing crisis up close. 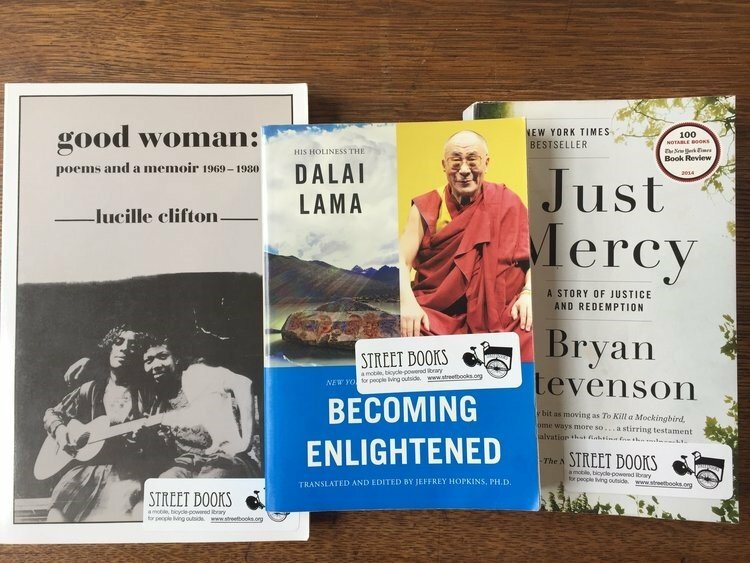 Street Books provides access to literature, conversation, and a community of support for people living outside. Read more at streetbooks.org. Official Street Book stickers mark the library’s vast collection, ranging from memoirs to science fiction to popular mystery novels. Although the rate of return is good among their patrons, the stickers have enabled other establishments, including County libraries and even the PDX airport, to return books to the organization. Street Books patron Cornell checks out “Cool For You” by Eileen Myles. RACC distributes nearly $800,000 annually in project grants to individual artists and nonprofit organizations based in Clackamas, Multnomah, and Washington counties. Grants are available under three categories: Artistic Focus, Arts Equity & Access, and Arts Services. On a rainy February day at Scouters Mountain Elementary, a class of fourth grade students pushed their desks and chairs aside and prepared for a journey through our solar system. Their guide was a teaching artist from the nonprofit BodyVox, who joined their class to lead a five-week residency called Making Science Dance. During this artist-in-residence program, students break off into pairs and use dance improvisation to demonstrate the concepts of gravity, orbit, and axial rotation. As a finale, the student teams perform their original choreography for their classmates, highlighting the science-based concepts they learned. BodyVox, widely known for their innovative and athletic dance performances, is also one of many arts nonprofits based in the Portland tri-county region that provides substantial arts education programming. 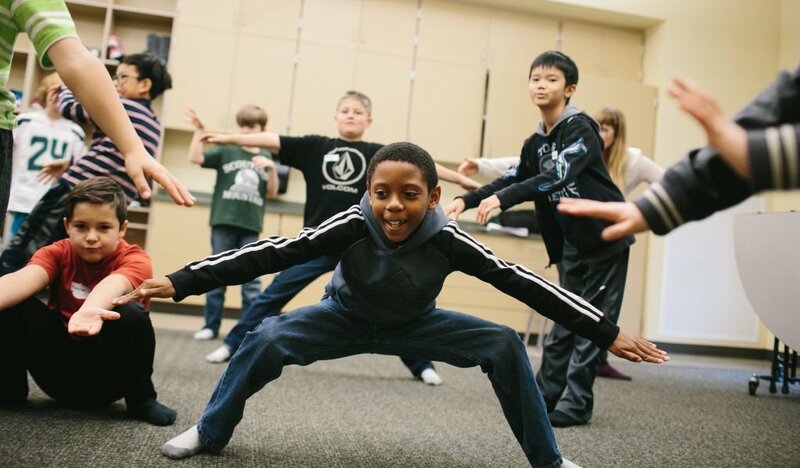 Fourth grade students at Scouters Mountain Elementary, a Right Brain partner school in the North Clackamas School District, work with BodyVox to explore the solar system through dance. Photo by The Right Brain Initiative. This work places BodyVox on a roster of 40 individual artists and arts organizations that partner with The Right Brain Initiative – a nonprofit program that convenes a broad spectrum of community partners to integrate the arts into academic curriculum. Right Brain is active in eight school districts throughout Clackamas, Multnomah, and Washington counties and engages 30,000 K-8 students each year. Planning for residencies like BodyVox’s Making Science Dance begins several months in advance when Right Brain staff sit down with principals, teachers, and artists to design experiences that seamlessly integrate an artistic discipline with the school’s curriculum and objectives. Central to Right Brain’s program is extensive on-going professional development that equips educators with high-impact, arts-based teaching strategies. Teachers use what they learn with students prior to an artist joining their classroom and long after that artist has gone. Oregon schools are continually under-resourced, and as a result, our state ranks among the lowest in the nation for high school graduation rates. Contributing factors include large class sizes, student absenteeism, poverty, and budget deficits. Schools that work with Right Brain see the benefit of additional resources and partners, including businesses, local governments, and artists, who collaborate to create long-term change within our school systems. For young learners, integrating a variety of art disciplines – such as dance, music, printmaking, and photography – helps them to form a deeper comprehension of academic subjects and connection to the world around them. Arts integration launches students beyond the traditional textbook and whiteboard into a comprehensive learning experience that boosts their critical thinking, teamwork and communication skills, and self-confidence. Many studies link student engagement in the arts with higher academic achievement and increased graduation rates. Post-graduation, students enter a workforce where 72% of business leaders cite creativity as the #1 skill they seek when hiring. Preparing kids for the future requires support for programs that teach them to problem solve, innovate and think critically. Two years ago, Portland-based Profile Theatre steered their artistic work in a new and exciting direction. They dedicated three full seasons to featuring only women and women of color playwrights in a field that has historically focused on the work of white male writers. Their three year initiative is designed to increase the diversity of the artists featured on their stage, enhance their ability to engage a larger and more diverse audience that more fully represents our community, and to elevate the voices of many underrepresented populations. Profile Theatre, now in their 21st season, is one of a dozen nonprofit arts groups hosted within Artist Repertory Theatre’s renowned red building on SW Morrison. They distinguish their work by centering their main stage productions and programming on a specific playwright each season. Photo: David Kinder for Profile Theatre. Participants in the Community Profile program find a creative outlet and share their lived experiences during monthly writing workshops. Complementary to their Diversity and Inclusion Initiative and main stage productions, Profile has launched two key community engagement programs. Through their In Dialogue series, they present staged readings of contemporary plays and host conversations with community members, to draw connections between the readings and issues in our community. Tickets to In Dialogue staged readings are low cost or free to increase access for those who may not be able to attend otherwise. 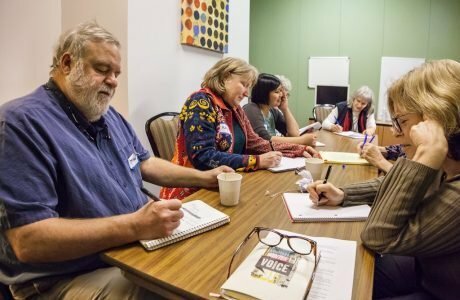 Their Community Profile program offers monthly writing workshops for community members who are particularly impacted by the featured playwright’s main themes and topics. This year, participants include people living with chronic illness, their family and caregivers. Profile is also making significant investments in their marketing, community engagement, and development programs to reach to new audiences – especially underrepresented communities. Early survey data and anecdotal observations suggest that their audience is slowly growing in younger patrons and people of color. Profile Theatre is one of 56 nonprofit arts organizations that receive RACC grant funding for general operating support. Both public dollars and also private donations to the Arts Impact Fund contribute to the programs and services of these organizations and help close the gap between their ticket sales and annual expenses. Profile Theatre’s 2018-19 season features both Lisa Kron and Anna Deveare Smith – two iconic American female playwrights who have extensive bodies of work and are still actively engaged in making art. Find upcoming performance dates and more information about their community engagement programs at profiletheatre.org. RACC’s General Operating Support grants provide essential unrestricted funding to nonprofit arts organizations based in Multnomah, Washington, and Clackamas Counties. Awards are based on artistic excellence, demonstrated administrative and fiscal responsibility, and ability to offer a wide range of high-quality arts programming to the community.